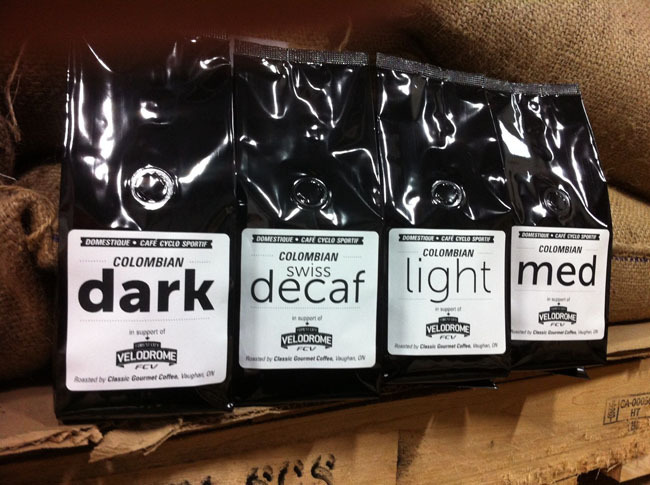 The Forest City Velodrome and The Domestique Café in Dundas have partnered to offer coffee drinkers four Premium Blend Colombian coffees. Please download an order form to use to collect orders. All orders need to be submitted to (ForestCityVelodrome@Live.com). The last day for coffee sales is Wednesday December 4th, 9 pm. • All youth Learn to Ride sessions. • Properly sized bikes, including road bikes, are routinely supplied to children. •Youth memberships are subsidized by the FCV. • The FCV school program, where Compu-bikes are brought into schools and grade 5-8 students "race" one another to introduce them to cycling and encourage them to come to a Learn to Ride session, is offered free to any school in the Thames Valley District. • Kits are supplied at discounted rates for youth racers. • Race fees are waived for children during the FCV track events. All monies raised will go to directly benefit the kids at the FCV. It is hoped that through fundraising events such as this, we can expand the benefits to the children, especially to economically disadvantaged youths, by subsidizing race fees for Ontario Youth Cup events, increasing the fleet of youth-sized bikes, and supplying discounted pedals and shoes to new riders. The FCV and the kids thank you very much for your support! * Home Delivery Charge: Up to 20 bags, $10; Up to 40 bags, $20; 60 bags or more, FREE!